This research project focuses on sustainable intensification of agriculture in highly productive peri-urban farming areas in China. This agricultural base is essential to meet China's increasing food production demands but is under pressure from urban pollution inputs, soil and water pollution from farming practices - particularly extensive use of mineral fertilisers and pesticides, and urbanisation. We will quantify the benefits and risks of a substantial step-increase in organic fertiliser application as a means to reduce the use of mineral fertiliser. Our approach is to study the role of soil as a central control point in Earth's Critical Zone (CZ), the thin outer layer of our planet that determines most life sustaining resources. Our Critical Zone Observatory (CZO) site is the Zhangxi catchment within Ningbo city, a pilot city of rapid urbanization in the Yangtze delta. We will combine controlled manipulati on experiments of increased organic fertiliser loading with determination of soil process rates and flux determinations for water, nutrients, contaminants, and greenhouse gas (GHG) emissions across the flux boundaries where the soil profile interfaces with and influences the wider CZ; surface waters and aquifers, vegetation, and the atmosphere. To guide the research design we have identified 3 detailed scientific hypotheses. Replacement of mineral fertiliser use by organic fertiliser will shift the soil food web for N/C cycling from one dominated by bacterial heterotrophic decomposition of soil organic matter (SOM) and bacterial nitrification to produce plant available N and loss of soluble nitrate to drainage waters, to one dominated by heterotrophic fungal decomposition of complex, more persistent forms of OM to low molecular weight organic N forms that are plant available. This change in N source will increase SOM content and improve soil structure through soil aggregate formation. Increased use of organic fertiliser from pig slurry (PS), and wastewater sludge (WS) will lead to increased environmental occurrence of emerging contaminants, particularly antibiotics and growth hormones. Environmental transport, fate and exposure must be determined to quantify development of microbial antibiotic resistance and other environmental and food safety risk, and develop soil and water management practices for risk mitigation. Decreased use of mineral fertilisers and increased use of organic fertilisers will reduce environmental and food safety risks from metals contamination; this is due to lower metal mobility and bioavailability from redox transformations, reduced soil acidification and increased metal complexation on soil organic matter. 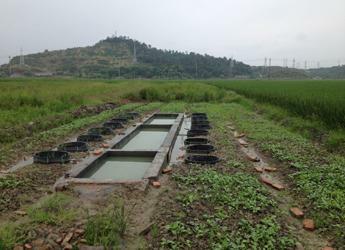 Our programme of research will conduct the manipulation experiments across nested scales of observation with idealised laboratory microcosm systems, controlled manipulation experiments in field mesocosms, pilot testing of grass buffer strips to reduce the transport of emerging contaminants from the soil to surface waters, and field (~1ha) manipulation experiments. Mechanistic soil process models will be tested, further developed to test the specific hypotheses, and applied to quantify process rates that mediate the landscape scale CZ fluxes as a measure of ecosystem service flows. GIS modelling methods include data from characterisation of a subset of soil properties and process rates at a wider set of locations in the catchment, together with catchment surface water and groundwater monitoring for water and solute flux balances. The GIS model that is developed will identify the geospatial variation in nutrient, contaminant, and GHG sources and sinks and will be used to quantify fluxes at the catchment scale. These results will determine the current baseline of ecosystem service flows and will evaluate scenarios for how these measures of ecosystem services will change with a transition to widespread of organic fertilisers through the farming area of the catchment. This project has been funded from the NERC/NSFC Newton critical zones Observatory call with Hutton involvement funded by the Scottish Government's Rural and Environment Science and Analytical Services Division (RESAS).